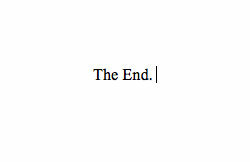 One person asked me if I was sad or depressed now that I finished my novel. He wondered if maybe I was upset that I was finally done with such a major project that took over a large part of my life. I said no, but I think that’s only because Blood Feud is but one small part of a larger project. In the fall, I start book 2 of the Emperors of Ethia series and I already have a name (and a loose first draft done) for the book… Dark Territories. And I’m dying to start working on it, but I can’t. Mostly because I just don’t have the time (being a stay at home mom does have it’s disadvantages during the summer), and I do feel like I need a little down time before taking on another major project. And yet I’m just itching to do it all again. I know, I love to torment myself mercilessly. And I know there are lots of others who feel the same way about writing as I do. For those who already have finished their first or fifth or twentieth novel, you already know all about reaching The End and I hope this is a pleasant reminder. And here’s a great big CONGRATULATIONS for you! Previous Post Hello There, Stranger! Next Post Should I Write a Novel or a Short Story? Happy Toots on the Happy Horn! I think you have a great first book. I’m looking forward to reviewing it on Amazon! CONGRATS!!! Great accomplishment! I love how you are already psyched about your next one—but, heck, you’ve already got the ball rolling on it too!